We had a great day 2 visiting more women growing our coffee and their farms. The mountains are steep and the roads rugged. You can't imagine how they drive during the rainy season. But the views were fantastic and so nice to be out in the countryside. This is Sue with Juanita and her daughter Yaneli. Juanita is married to Saul and they have 6 children ages 8-25 years old. We traveled 35 minutes up rugged roads into the mountains to arrive at their beautiful farm. Juanita is growing about 1.25 acres of organic coffee and 2.5 acres of conventional coffee. They have some cows for milk and meat and also 2 horses. They also grow some of their own corn and beans. Juanita with some of her coffee. Her fields looked healthy and well cared for. Juanita, Saul and two daughters and some of their grandchildren. This is Irma. She and her husband Jobino have 6 children ages 10 yrs - 24 yrs. Both husband and wife grow coffee but keep their coffee fields separate. Their parents and grandparents grew coffee. They recently moved to new land so Irma's coffee plants are just 2 years old. Their oldest daughter is a teacher and their 23 yr old Nilsan is studying accounting at university in Huehuetenango. Irma's 21 year old son works in the coffee fields and also is a mechanic. All the family helps in the coffee fields. Irma first and foremost likes the money from growing the coffee. 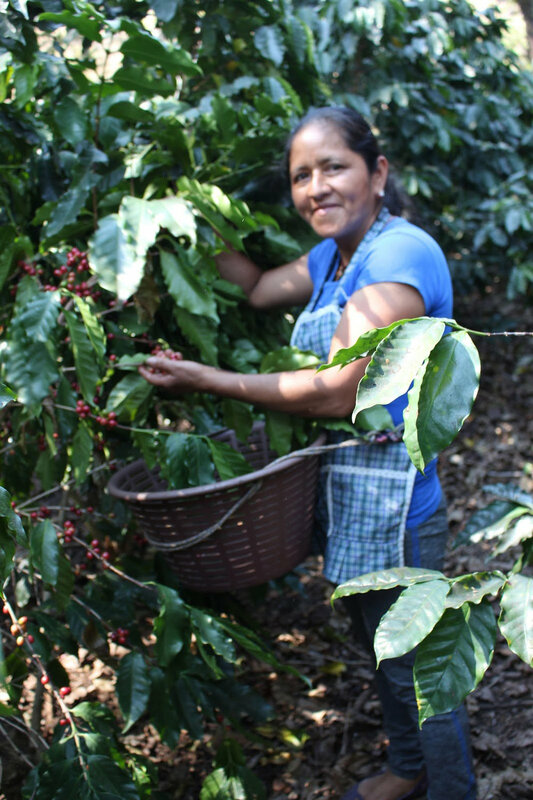 She likes working with the women's coffee growers and she participates in the classes and trainings they offer. She likes growing organic coffee because it's more healthy for her family and the environment and also she is paid a higher price. She and her husband make most of their own fertilizer from the coffee fruit ( the outside of the coffee fruit is removed and the bean is the 2 inside seeds). mixed with manure from their horses and cows. Being able to supply their own fertilizer is a cost savings also. kids work in the coffee fields too but also are studying in school. Irma, her husband Jobino and Yenner Daniel 10 yrs old and in 4th grade. These families are very busy and we were very grateful they could take the time to visit with us and answer our questions. I asked at UPC (the organization they all work with) if they have lots of visitors. They said we are one of two groups that visit. Irma was especially shy with us which is completely understandable. We hope to keep developing our relationship with these women and their families. This is our 5th year visiting and the women we've seen more than once seem more relaxed with us. Our hope is for our friendships and trust to grow more each year.